Aduanaman, 100 applause now to NK-Entertainment, the originators of this brilliant idea but wait; let's reserve 70 till the climax on the D-day. Fortunately, we are freely given 24 hours in a day. Who decides that we can't make money and keep the town alive even after darkness falls? Im a strong believer in nightlife for many reasons: it promotes new business, it showcases culture of a people and thereby boost tourism, enhances entertainment, keeps the towns and cities alive at night and I dare say that it is an exercise of the supreme mandate of men to dominate the earth by never letting darkness decide our fate. Besides clubs, pubs, parties, concerts and shows, one ancient avenue for nightlife but a blind spot to many is night market. Night Market has its origin in Asia about tens of thousands of years ago. The transcendence of night market has attracted the attention of the world. Here in Ghana some notable of night markets are on some university campuses and OMG, Osu in Accra. 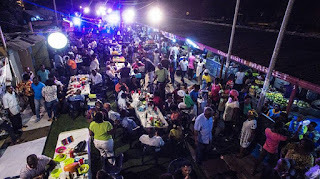 The Osu night Market for instance is the most vibrant of all such that it had contributed so much to the fame of that part of Accra. Therefore, having such an activity in our own town, Dormaa-Ahenkro should not only welcomed and tightly embraced but strongly supported by all of us so we attract the attention of outsiders. Once again, double thank you to those planning this event. What at all is this Dormaa Night Market going to be about? According to NK Entertainment, the organizers, it shall be a night of buying and selling, eating and drinking, hanging out with friends and making new ones as well as enjoyment of live music performances under the night sky. Some food items to be expected are very hygienic and aromatic kelewele, pastries, ice cream, drinks, fruits, kenkey with fish, Jollof rice, fried yam with shito, indomie, fried eggs with bread, fufu and so much more. Other items to expect are footwear and clothes (boutique and ofoase), phones and accessories, electrical equipment etc. Service providers in health care, banking, property holdings, telecommunications etc. are also to be expected. Business men and women are also expected to join the market from neighboring areas such as Nkrankwanta, Wemfie and Berekum. They added that entertainment shall definitely be on the bill. Live performances from cherished singers will be employed to stir the mood. They revealed that the D-day will be communicated later, however the proposed venue is the Dormaa Presby Park which according to them will be beautifully prepared with lightening and sounds. Asked if it will be free for all, they laughed and mentioned that it shall be free for all buyers but all those who will mount a table or stand shall be required to pay a fee which shall also be announced to in no time. They hope to pull crowds from all over Kraaso, Jericho, New Dormaa, ABB, SS, Kyekyenkye and every corner. Rich or poor, young or old, they hope to get you into the circle. Since this is the first of its kind in town, they count on the support of the municipal assembly, the police service and the general public. Everyone especially the working class is invited to a Nightlife in Dormaa-Ahenkro. They summed up saying they expect everyone to come along with families, friends and lovers; also come with happiness and more money to enjoy the busy and memorable night. At the end of the day, they hope to make everyone happy and above all make Dormaa-Ahenkro very famous in the area.